It must have made an impression. Three times within a week of reading it I made reference to it. The “it” was an analogy from Jim Collins on the wisdom of firing bullets first before firing cannonballs. The most notable was when a new acquaintance asked if he could stop by my office and get my thoughts on a new “employee benefit” he was considering selling. David was contemplating a new sales job and needed advice on whether it was worth going after this opportunity. Since I work for an employee benefits firm, a mutual friend had suggested David speak with me. Remembering how much I valued networking during my own job search 8 years ago, I was happy to meet with him. The product David was considering was something with which I was familiar. It was a product others had brought to us. When you work in employee benefits you find there are many vendors who would love to view us as a strategic partner so they can gain access to our clients—knowing our trusted relationship with our clients would give immediate credibility to whatever they wanted us to promote on their behalf. We had evaluated this product before and concluded it was not something that fit within in our bucket of services. Moreover, we felt that it was a product that lacked credibility and, therefore, we didn’t want to risk our reputation with our clients on this type of product. I shared this with David. Furthermore, I told him I doubted there would be many reputable employee benefit brokers in Atlanta willing to promote this product. I could tell David wished for a more favorable response, however, as Patrick Lencioni writes in his book Getting Naked, a consultant with the best interest of their client “will confront the client with a difficult message, even when they client might not like it hearing it.” I don’t believe David liked my message, but I did give him honest feedback. David then shared how, in previous roles, he had established great relationships with HR staff in hospitals. “Perhaps these relationships,” he said, “would be a place where I could have success with this product.” This is when I recalled the analogy of the bullets and cannonballs from Jim Collins’ Great By Choice. With a tremendous amount of research, Collins shows how many of the companies that have produced success at a rate 10 times their industry averages often tested new initiatives using the bullet approach before launching cannonballs. Collins describes two types of cannonballs. An uncalibrated cannonball is a significant initiative where the organization or individual invests a vast amount of resources, time and effort in launching the initiative without having first tested the market. Putting almost everything they have into the initiative, they fire their cannonball. It’s a gamble—a big gamble. If the cannonball hits the target, they win. If the cannonball, however, misses they lose and lose big. When an uncalibrated cannonball misses it is often tragic and fatal to the organization. Collins suggests that organizations fire calibrated cannonballs by shooting bullets first. Bullets are smaller initiatives. They are tests. They are pilot projects. They produce empirical data from which an intelligent decision can be reached. Colllins purports that a “bullet is an empirical test aimed at learning what works.” A bullet will meet three criteria. A bullet is low distraction. The goal of bullets, writes Collins, is to gather “empirical validation gained through actual experience.” Once information is gathered through the shooting of bullets the organization can then calibrate their cannon and aim to where the bullets hit their target. I don’t know yet if David has applied the principle of firing bullets first, but I do know the analogy has resonated with me. 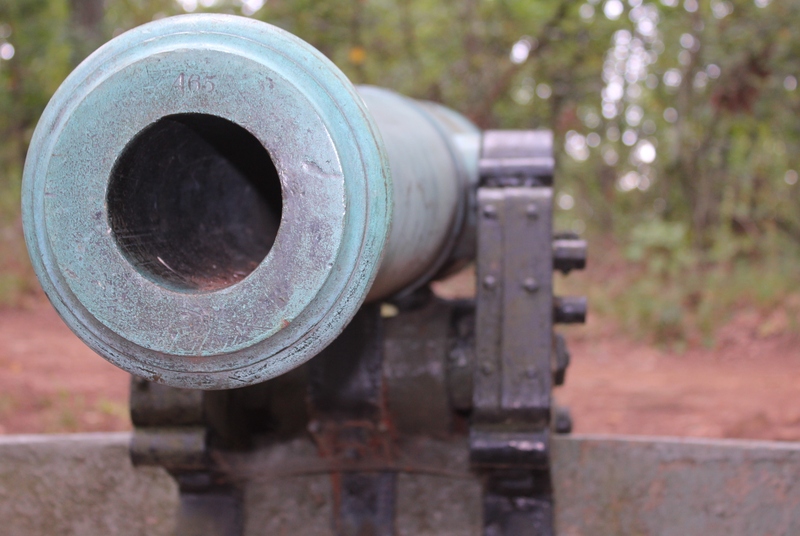 One day after speaking with David I was on a hike with my son at Kennesaw Mountain where there are several cannons on display. The sight of the cannons triggered by thoughts and I shared Collins’ principles with him. The very next day I was back at the office and again, this same principle came to my mind as our leadership team was discussing marketing strategies. I relayed the concept of firing bullets and then calibrated cannonballs. I then proceeded to encourage our team to find ways to fire bullets in the direction of some of the initiatives we were considering. If this resonates with you I recommend you read Collin’s Great by Choice where you will find meaningful examples of organizations which used the bullet and calibrated cannonball approach.